I just finished listening to Book 2 of the Horizon series, Deadzone by Jennifer Nielsen. This is one of those kids' series (7 books planned, in this case) in which each novel is written by a different top-notch author. 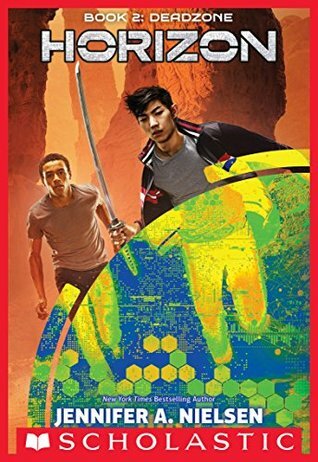 I previously read and reviewed Book 1, Horizon by Scott Westerfeld. Book 2 continues the suspenseful and action-packed story that combines survival and sci fi. In the first book (you can read my review here - no spoilers), eight kids survived a plane crash in the Arctic and found themselves in a strange, jungle-like environment, filled with alien-looking flora and fauna they'd never seen before. Now, in the second book, the survivors have managed to escape the dangerous jungle, only to find themselves in an even scarier desert-like environment filled with even stranger phenomenon. Four of the kids were traveling as a team to an international robotics competition, so their scientific expertise comes in handy, as they face one challenge after another, in an effort to survive...and hopefully to escape this strange landscape and eventually get back home. There are plenty of puzzling mysteries here - how did this plane fall out of the Arctic sky and end up in this strange place? As the kids discover stranger and stranger technology behind some of the bizarre things they encounter, they also wonder where it came from and who is behind it? In this second book, the kids' individual personalities are further fleshed out, as they learn to work together as a new team and one of their own is in imminent danger. Nielsen does a good job of moving the story along - always to unexpected places - and editing ensures a smooth story from one book/author to the next. The fast pace continues in this book, with plenty of suspense and intrigue to keep the reader interested. As with this first book, this one ends with a cliff-hanger, so I'm looking forward to listening to book 3! Or order Deadzone from Book Depository, with free shipping worldwide. I like the concept behind this series and hope it would spur students on to read other books by the author of the installments they like. That's a good thought, Helen! I bet this series and others like it would have that effect - always fun to discover new authors!